I started the Denyse Schmidt Cog & Wheel quilt earlier in the summer. I was planning ahead to make this as a wedding gift for a dear friend. The wedding arrived rather quickly and then passed in September. Last week, I finally finished assembling the blocks together. This is going to be a twin size quilt. 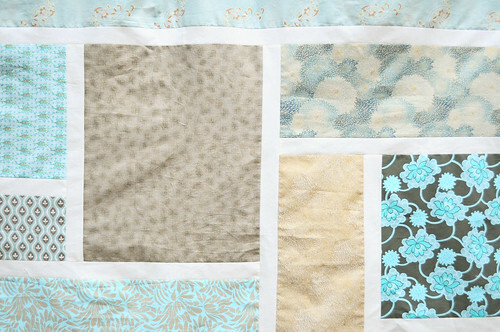 With all my leftover scraps, I put together this scrappy-style backing. The Cog & Wheel was pretty fun to sew together. The large scale curves are actually not too hard once you get the hang of it. They just require lots and lots of pinning. This was my first quilt made from a commercial pattern and now I have a few others, I want to try out next. I spent a couple hours basting this quilt last week, so it is ready for machine quilting. 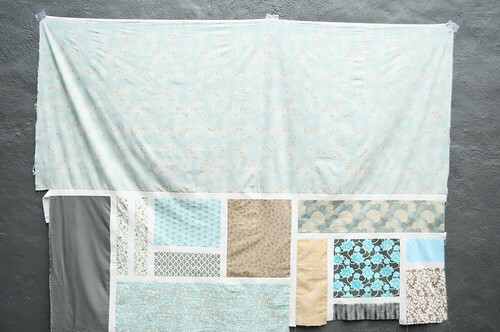 I’m so tempted to send this to a long arm quilter, but I also want to do it myself. Perhaps a long arm machine is in the workroom’s future??!! 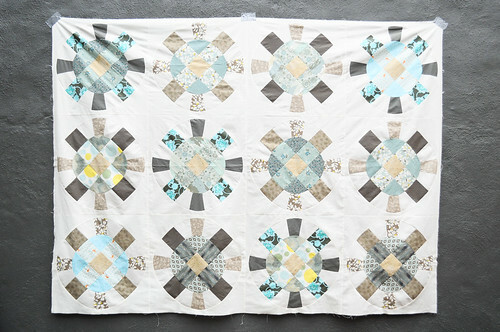 I am setting a goal of finishing this quilt + another basted quilt before the new year. This is so I am able to start on my Quilt Sampler 2 with a lighter load. 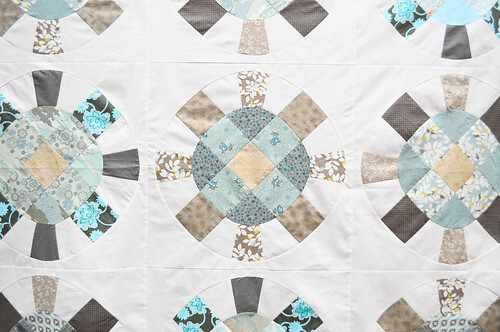 I’m going to pull out all my ongoing quilt projects and do a status report this week. I have a feeling there are about 6-ish quilts in various states of progress right now. This seems pretty normal, but I’d like to move a few more to my ‘finished’ pile. Looks great Karyn – love the colour! I was working on mine last night – only 3 blocks to go! I love the back! The frames around the patches make them all look like little bits of art. looking great Karyn! love the colour pallet! Beautiful! Congratulations Karyn! The back is positively inspired–love that stained glass look. I’m looking forward to working on mine when I have a bit of time over the holidays. Such a great pattern! Looks amazing, Karyn. I’m feeling inspired to get back to work on mine … maybe finish it over the holidays even! oh em gee, karyn, this is GORGEOUS! this might just inspire me to buy the pattern it’s so beautiful.